It's been said that art, creativity, and innovation are about the recognition and mastery of constraints. "Man built most nobly when limitations were at their greatest." "In art, truth and reality begin when one no longer understands what one is doing or what one knows, and when there remains an energy that is all the stronger for being constrained, controlled and compressed." One of the best ways to be truly creative--breakthrough creative--is to be forced to go fast. Really, really, really fast. From the brain's perspective, it makes sense that extreme speed can unlock creativity. When forced to come up with something under extreme time constraints, we're forced to rely on the more intuitive, subconscious parts of our brain. The time pressure can help suppress the logical/rational/critical parts of your brain. It helps you EQ up subconscious creativity (so-called "right brain") and EQ down conscious thought ("left brain"). I'm not talking about the kind of time pressure we get from trying to get real work done under unreasonable deadlines. I'm talking about a specific technique for using speed as a creativity driver. I talked about this earlier in Build something cool in 24 hours, based on a talk by Ritual Entertainment game guru Squirrel Eiserloh. Squirrel is one of the founders of the Ad Lib Game Development Society, and an active participant (and advocate) of the Jam model for creating both games and music. 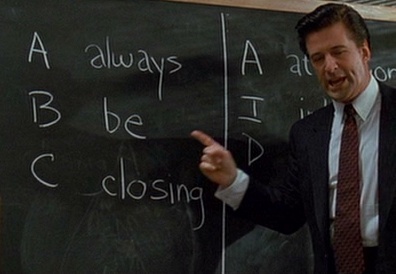 Squirrel said one of their main mottos is from the Glengarry Glen Ross movie, where Alex Baldwin tells/threatens the sales people to "always be closing." You aren't there just to do things...you're there to make things. To get something finished, no matter how crappy and ultimately unusable, in the given--insane--time constraint. Another jam format that's been gaining ground is the deathmatch or "battle". But unlike the live Battle of the Bands format (or Poetry Slams), which are simply live competitions, the creativity deathmatch/battle is about creating in real-time. In other words, you aren't just playing your pre-written music or reading your pre-written poems in front of a live audience, you're also creating something from scratch. "The monthly competition...pits 16 people in a tournament to find the most talented laptop musicians in town. Players get three minutes to whip up whatever noise they want, as long as it comes from only a laptop and a MIDI controller device. The most exciting thing about the event, really, is that nobody actually has a clue what "most talented laptop musician" means." But Skyler has been raving about the Art Battle held at the Installation Art Gallery/Skateboard Shoe store here in Boulder. 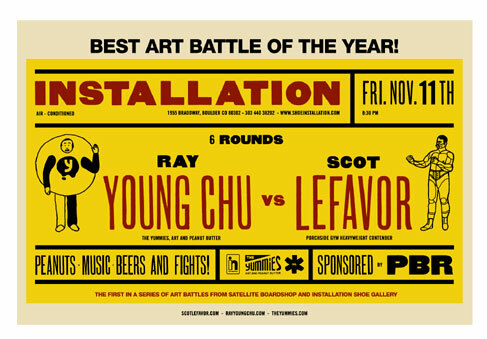 Sponsored by (who else) Pabst Blue Ribbon, artists Scot Lefavor and Ray Young Chu battled it out before a live audience. Every 30 minutes the host would announce a word or phrase and the two artists had to race to depict it. "10 video artists and 20 musicians create original works in a limited time frame using provided source materials.... contributors will be supplied with 10 visual or audio samples, which they will in turn use as source material for an original piece of music, sound, or video." When you're crafting something -- a final product like a software app, painting, piece of music, etc. -- slowing down can make all the difference between crap and not crap. But when you're trying to make creative breakthroughs, slowing down gives the rational part of your brain all the time it needs to stop an idea before you're barely aware of it. When it comes to building/creating/playing something you didn't even know you were capable of, speed is your friend. But this brings me back to the picture at the top, and Squirrel's motto "Always Be Closing. As most of you already know, Tim O'Reilly's geek campout, Foo Camp, has spawned a number of other 24 to 48 hour "camps" and "jams" including Bar Camp, and the recent Seattle Mind Camp. While these are awesome experiences, and I wish there were more--these events should not be confused with creativity jams. While Foo Camp is where I first learned of the Game Jam format, from Squirrel's talk, Foo Camp was itself not a make-something-cool-while-you're-here-to-demo-at-the-end kind of thing. The camps are more about talking about things people have built rather than actually building them in real-time. The camps offer a different form of creativity--more about synthesis and getting new ideas than tapping into the power of your subconscious creativity. In the movie industry a high value is justifiably placed on technical competence. It is assumed that every craftsperson should know how to use the tools of the trade and be able to perform on cue, under pressure. The trouble with paying so much attention to skill and technical prowess is this: The frame of mind in which interesting things germinate is often more confused and desperate than organized and confident. " Great post. A couple of years ago, I participated in a similar creativity jam. It's a month long quest to produce a 50,000 word novel. National Novel Writing Month...it runs every November. I wrote a lot of crap to hit that target, but I also got some good stuff down on paper in the process, which I may actually do something with someday. :) Check it out at www.nanowrimo.org. Jessica, Nano is a great way to up the creativity of your writing. I did it a few years ago as well. Unfortunately I am working my way through the rewrite at a snail's pace but as I read through it there is some lovely stuff I don't think I would have gotten without the deadline driving me to just write. I completed Nanowrimo this year! I tried a couple years ago and died around 5,000 words. I'm very proud of myself. I'm close to the end of the novel itself too, so I'm really looking forward to finishing and then putting it away for a long time before I suffer looking at it again (and then fingers crossed that I can edit into something good... I love the story, I just wish it was written well!). On the adlib game development note, Ludum Dare ( http://www.ludumdare.com - some form of website may or may not be in existence as you read this) is having their 8th(?) semi-biannual 48-hour game development contest this very weekend! I absolutely love these things. It always inspires truly new things in gaming (as the post discusses, in large part due to limitations - there's a theme provided, and trying to come up with something to fit it makes you do cool stuff). My entries from previous contests are on my website (Freebies > Gamelets). It's quite ad-hoc this time around, so sorry if the page isn't there when you see this! I’m sure there’s much creativity in what people call extemporaneous activities. However, we shouldn’t think of extemporaneous as entirely spontaneous, especially if that includes some notion of unprepared. The best extemporaneous artists are almost always exceptionally well prepared people. They “innovate” or “create” employing one or more of possibly many well rehearsed patterns that they apply to the unique circumstance they find themselves in. When you learn extemporaneous skills, you’re actually learning the patterns that work best for you and developing experience in their application in various circumstances. If the extemporaneous artists don’t share this, you really can’t hold it against them – magicians often keep their tricks a secret as well. I think it’s clear that necessity is the mother of invention. Pressures of all sorts can drive creative responses. And time pressure may be a handy tool given that it’s one sort of pressure you can impose upon yourself without any/many adverse side-effects. Creating pressure through exposure to the elements, for instance, may also incite a little creativity, but has a drawback or two of its own. Finally, do you think “practicing” with time pressures would have a beneficial effect on your creative output generally? For me, things I label creative almost never happen under time pressure. They tend to surface when I’m immersed in something else entirely. At that point it’s usually a frantic rush to get it all recorded somehow. This is a great read. 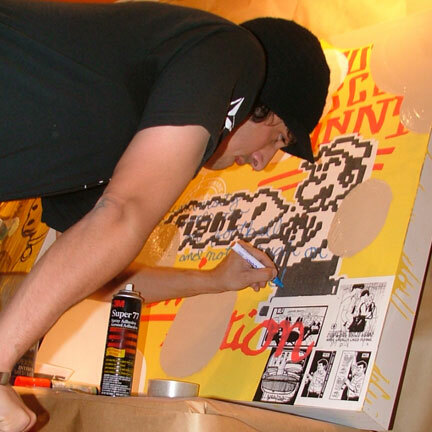 In art school, I noticed I made the biggest breakthroughs when I had severe limitations. Between that and the 5k contest, I started to think there may be something behind it, and this article makes that point. Interesting observations. As a painter, I know from a first hand experience (make it a repeated first hand experience) that I myself, as an author, am not the best judge when it comes to deciding when is my canvas done. Simply put, I tend to overdo things. I am aware of this because my best work is invariably the one I was forced to abandon before I got a chance to finish it. You know how it goes -- I'm in the middle of doing it, something comes up, yanks me away from my easel, and then one thing leads to another, and eventually I never get a chance to return to the canvas. Meanwhile I get involved with other projects, I've started work on other canvases, so for me the first unfinished canvas is a writeoff. But then something strange happens: after a while, I return to the original canvas with the intention to finally complete it, and much to my shock, I realize that it's just perfect! I'm incapable of explaining how does that actually work, but really and truly, what I thought was rough and unfinished piece of work, almost a sketch, turns out to be perfect. I wouldn't add nor remove even a single brushstroke. I was talking to a friend artist about this, and he had a brilliant idea. He suggested we conduct an experiment -- I start working on a canvas, and he sort of decides to call me on my phone at a completely random time. The deal is, once I receive his phone call, I am obliged to stop working. We haven't had a chance to try the experiment yet, but I'm really curious to see the results. Talk about the boiling pressure! Rather than the Glengarry Glen Ross movie, this post makes me think of the Dead Poets Society. You know, where Robin Williams grabs one of the boys and spins him around until poetry spouts out of his mouth. Personally, I find adopting a fake accent releases the inhibitions to creativity. Earned me the nickname 'Frenchy'! This article makes me think of two things. First, it reminds me of the weekend charette way back in design school. Given 36 hours, a four person multi-disciplinary team, and a design problem people would produce amazing ideas. A book is the second thought I had. This argument, in some ways, similar to the one Malcolm Gladwell makes in Blink. Gladwell basically argues that given enough training and experience, people's first thought and reactions are more reliable than ones given more time to develop. I run into this with design problems all the time. Sometimes rehashing something just drains the fun and life from a good idea. My all-time favorite instance of "creativity on speed" was in the movie Apollo 13 (http://www.imdb.com/title/tt0112384/) -- "Houston, we have a problem" -- when the team at Mission Control had to figure out a solution to problems created by an explosion in one of the oxygen tanks of the spacecraft (the wikipedia entry has more details: http://en.wikipedia.org/wiki/Apollo_13). In particular, I'm reminded of the scene where the mission director came into a room full of engineers with a box full of all the equipment the spacecraft crew had available to them on board, dumped it onto the table, and told the crew on the ground this is what their colleagues in space have to work with, and it was up to them to find a solution before the oxygen supplies ran out on the spacecraft. The PBS special on Apollo 13 (http://www.shoppbs.org/sm-pbs-apollo-13-to-the-edge-and-back-dvd--pi-1912722.html) was factually more informative, but the movie starring Tom Hanks was more inspiring, largely due to the compelling illustration of creativity on speed. This past summer I had my first filmmaking experience as part of a team involved in the 48 Hour Film Project ( http://www.48hourfilm.com/ ). There were 36 teams in St. Louis alone. At the start time each team was given a character, prop, line of dialogue and genre. Then we had 48 hours to write, plan, shoot and edit a 5 to 7-minute film. It was fun, frustrating, draining and exhilarating all at the same time. And some of the resulting short films (ours included) were truly well-done, creative and entertaining. Yes, speed does indeed inspire creative thinking and action! I had the good fortune to write for and direct projects in the Cincinnati contest for the past two years. I got to work with amazingly talented, creative, and funny people! Our movies didn't win, but they're great and worth the watch! No charges. No personal information requested. Just normal downloads. like the 48 hour film project mr. baker mentioned above. but faster, shorter, etc. "Zooomr Adds Photo Trackbacks... In Less Than An Hour"
I stumbled across your blog while I was doing some online research. I recently completed my MFA in Creative Writing, and many of my classmates have confided that they were writing much more prolifically and creatively with those class due dates hanging over their heads constantly. Interesting! I just finished CampusMovie Fest - a 7 day, 5 minute film festival held at our schoold, but done nation wide. Our gymnastics documentary placed in the top 16, and got viewed to a packed audience at Memorial Auditorium. Now I'm going to National Novel Writing Month. (nanowrimo.org) It's all so exciting! I think such artists deadmatch would be very interesting.People love to create new things and this form of contest will help them show their best.